Some may find the photos, details and articles published on this page, disturbing and distressing. Therefore it is advised that viewers who wish to read these pages, do so at their own discretion. LEAH HELENA VIEIJRA was born 28 June 1842 in Amsterdam, Holland, and died 31 January 1920 in Amsterdam, Holland. She married (1) EMANUEL HENRIQUES DE LA FUENTE 01 May 1867 in The Hague, Holland, son of JACOB LA FUENTE and ZIPORA VERVEER. He was born 06 April 1844 in The Hague, Holland, and died 26 January 1871 in The Hague, Holland. She married (2) JACOB RIMINI 12 December 1877, son of JECHIEL RIMINI and REBECCA VIEIJRA. He was born 07 March 1847 in Amsterdam, Holland, and died 1910. Are you related to Lea Helena Vieijra? 1. DAVID HENRIQUES DE LA FUENTE, b. 28 May 1869, The Hague, Holland; d. 22 February 1938, The Hague, Holland. 2. JACOB HENRIQUES DE LA FUENTE, b. 28 March 1868, The Hague, Holland; d. 11 February 1944, Auschwitz concentration camp, Poland - Holocaust victim. 3. EMANUEL HENRIQUES DE LA FUENTE, b. 31 May 1871, Amsterdam, Holland; d. 03 December 1942, Auschwitz concentration camp, Poland - Holocaust victim. 1. ALEXANDER RIMINI, b. 23 December 1878, Amsterdam, Holland; d. 02 July 1943, Sobibor death camp, Poland - Holocaust victim. 2. REBECCA RIMINI, b. 15 April 1880, Amsterdam, Holland; d. 28 January 1944, Auschwitz concentration camp, Poland - Holocaust victim; m. LEVY GARNADE, 27 October 1920, Amsterdam, Holland. Resided, June 01, 1941: Willem Arntsz Hoeve psychiatric institution, Dolderscheweg 164, Den Dolder, Holland. In the fall of 1942 several Jewish patients from Amsterdam and The Hague arrived at the Willem Arntsz Hoeve psychiatric institution. On 2 February 1943 seventeen patients were taken away by the Nazis. On 27 November 1943 Nazi vans came to fetch more patients. Several staff members vehemently resisted. On 13 December 1943 the vans returned. 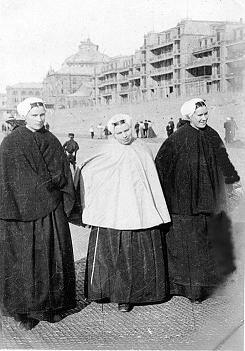 The last Jewish patients were deported and several staff members arrested. 3. LEENDERT RIMINI, b. 21 March 1882, Amsterdam, Holland; d. 21 June 1884, Amsterdam, Holland. 4. FENNI RIMINI, b. 01 June 1884, Amsterdam, Holland; d. 02 February 1931, Amsterdam, Holland; m. ASSER KLEIN, 02 January 1908, Amsterdam, Holland; b. 15 August 1865, London, England; d. 16 June 1923, Amsterdam, Holland. JACOB HENRIQUES DE LA FUENTE was born 28 March 1868 in The Hague, Holland, and died 11 February 1944 in Auschwitz concentration camp, Poland - Holocaust victim. He married BENVENIDA ENGERS 16 January 1890 in Amsterdam, Holland, daughter of HIJMAN ENGERS and SIMHA MELJADO. She was born 23 March 1861 in Amsterdam, Holland, and died 04 February 1924 in Amsterdam, Holland. 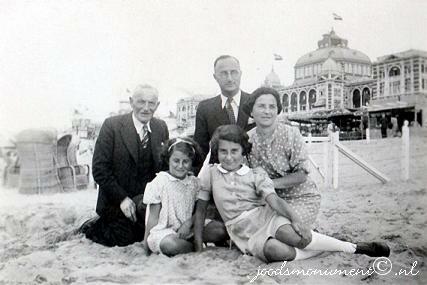 First photo: Jacob Henriques de la Fuente (left) with the family of his son Leonard at the Scheveningen beach, The Hague, Holland - 1940. Second photo: Scheveningen beach, The Hague, Holland – 2012, with approximate point where the de la Fuente family were sitting on they’re visit in 1940. 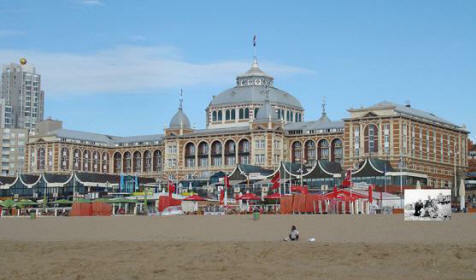 Scheveningen is a coastal result suburb of The Hague, 30 miles distance from the city of Amsterdam. 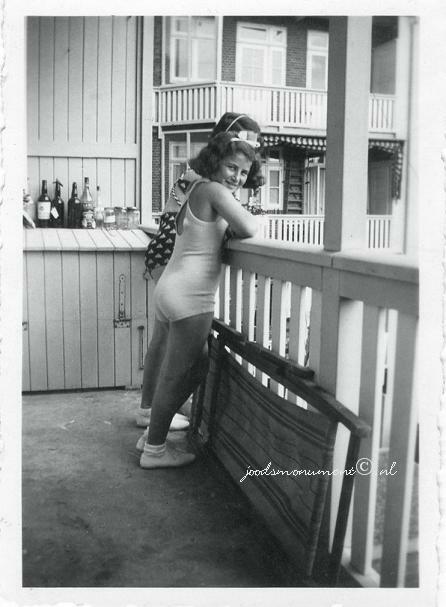 Prior to the the 1960s when holidays abroad were not affordable to the less well off, Scheveningen was a popular day trip and holiday resort for the working class families of Amsterdam and the big cities, including the Sassienie family relatives where most of them took their holidays. In England, the coastal town of Southend on Sea, located on the Essex coast was known for its many visitors from the East End of London, prior to when holidays abroad became more affordable. 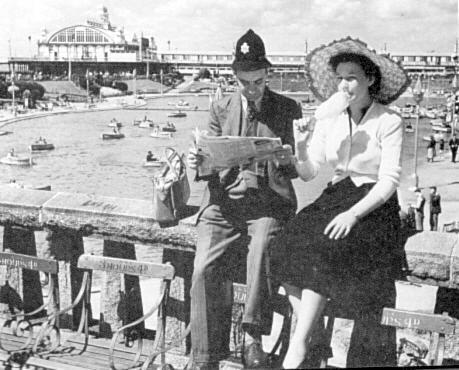 Similar to the coastal town of Scheveningen, Southend on Sea is 30 miles distance from the East End of London, was a popular day trip and holiday resort for the working class families of London and the big cities, including the Sassienie families, where most of them took their holidays. Scheveningen could be described as the Dutch equivalent of Southend on Sea during those times. 1. HELENA HENRIQUES DE LA FUENTE was born 11 April 1891 in Amsterdam, Holland, and died 06 October 1944 in Auschwitz concentration camp, Poland - Holocaust victim. She married RUBEN VELLEMAN 08 April 1915 in Amsterdam, Holland, son of JESAJAS VELLEMAN and AALTJE NOORT. He was born 11 January 1894 in Groningen, Holland, and died 20 February 1945 in Dachau Concentration Camp, Dachau, Germany - Holocaust victim. Resided with wife, February 1941: Rivierenlaan 8, Amsterdam, Holland. Ruben Velleman worked as a butler in the Apeldoornse Bos, where he started working on 1 September 1942. Apeldoornse Bos: Jewish psychiatric institution, where amid the forests near Apeldoorn. Jews were treated for psychiatric disorders according to the latest methods from 1909 onward. The Apeldoornse Bos expanded rapidly. By 1938 the institution had 900 patients, including 74 at the Paedagogium Achisomog, a special residential ward for mentally retarded and wayward children. In the night of 21 to 22 January 1943 the Apeldoornse Bos was ’emptied‘. With Aus der F?nten in charge, the Apeldoornse Bos was searched, and helpless patients were beaten and abused and loaded first into trucks and then transferred to cattle cars. The train with patients and nurses headed straight through to Auschwitz, where almost everybody was killed immediately upon arrival. 2. EMANUEL HENRIQUES DE LA FUENTE, b. 11 June 1892, Amsterdam, Holland; d. 21 May 1943, Sobibor death camp, Poland - Holocaust victim. 3. 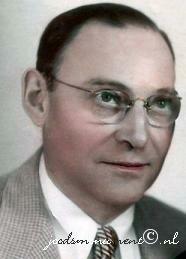 HIJMAN HENRIQUES DE LA FUENTE, b. 24 January 1894, Amsterdam, Holland; d. 19 October 1978, Adelaide, Australia. 4. SOPHIE HENRIQUES DE LA FUENTE, b. 19 May 1895, Amsterdam, Holland; d. 08 October 1942, Auschwitz concentration camp, Poland - Holocaust victim. 5. DAVID HENRIQUES DE LA FUENTE, b. 27 January 1897, Amsterdam, Holland; d. 04 May 1990, Miami-Dade County, Florida, USA. 6. LEONARD HENRIQUES DE LA FUENTE, b. 28 March 1902, Amsterdam, Holland; d. 08 June 1926, Auschwitz concentration camp, Poland - Holocaust victim. EMANUEL HENRIQUES DE LA FUENTE was born 31 May 1871 in Amsterdam, Holland, and died 03 December 1942 in Auschwitz concentration camp, Poland - Holocaust victim. He married (1) JUDIK SON 09 December 1897 in Amsterdam, Holland. She was born 02 May 1871 in Amsterdam, Holland, and died 10 February 1916 in Amsterdam, Holland. He married (2) ABIGAEL COUTINHO 24 May 1917 in Amsterdam, Holland, daughter of MORDECHAI COUTINHO and SIMHA DELMONTE. She was born 13 October 1876 in Amsterdam, Holland, and died 03 December 1942 in Auschwitz concentration camp, Poland - Holocaust victim. Resided with family April 1942: Van Swietenstraat 92, Den Haag, Holland. Occupation: Lodging-house keeper, diamond polisher. The Jokos file reveals that a claim was lodged for compensation for valuables surrendered to the Lippmann-Rosenthal looting bank (L-claim, number 3674/18975). 1. EMANUEL DE LA FUENTE, b. 12 October 1898, Amsterdam, Holland; d. 30 September 1942, Auschwitz concentration camp, Poland - Holocaust victim. Resided: Beethovenstraat 64 III, Amsterdam, Holland. 2. SIMON DE LA FUENTE, b. 01 April 1901; m. JANNETJE RAAFS. ALEXANDER RIMINI was born 23 December 1878 in Amsterdam, Holland, and died 02 July 1943 in Sobibor death camp, Poland - Holocaust victim. He married DUIFJE AGSTERIBBE 09 April 1914 in Amsterdam, Holland, daughter of SALOMON AGSTERIBBE and MIETJE VAN PRAAG. She was born 02 October 1885 in Amsterdam, Holland, and died 02 July 1943 in Sobibor death camp, Poland - Holocaust victim. Resided, February 1941: Amstellaan 35 I, Amsterdam, Holland. The Jokos file reveals that a claim was lodged for compensation for valuables surrendered to the Lippmann-Rosenthal looting bank (L-claim, number 9975/8379). 1. JACOB RIMINI, b. 26 January 1915, Amsterdam, Holland; d. 02 July 1943, Sobibor death camp, Poland - Holocaust victim. 2. ANDRE RIMINI, b. 27 August 1918, Amsterdam, Holland; d. 10 September 1941, Mauthausen-Gusen Concentration Camp, Mauthausen, Austria - Holocaust victim. EMANUEL HENRIQUES DE LA FUENTE was born 11 June 1892 in Amsterdam, Holland, and died 21 May 1943 in Sobibor death camp, Poland - Holocaust victim. He married JETTE POOL 04 September 1919 in Amsterdam, Holland, daughter of DANIEL POOL and CLARA ROODENBURG. She was born 09 November 1892 in Amsterdam, Holland, and died 21 May 1943 in Sobibor death camp, Poland - Holocaust victim. Resided with family, February 01, 1941: Valkenburgerstraat 1 huis, Amsterdam, Holland. Belonging to: Emanuel Henriques de la Fuente and his family, Amsterdam. 1. JACOB HENRIQUES DE LA FUENTE, b. 08 June 1920, Amsterdam, Holland; d. 16 August 1942, Auschwitz concentration camp, Poland - Holocaust victim. HIJMAN (HARRY) HENRIQUES DE LA FUENTE was born 24 January 1894 in Amsterdam, Holland, and died 19 October 1978 in Adelaide, Australia. He married CECILIA WILHELMINA HULSMAN 20 March 1929 in Amsterdam, Holland, daughter of HENDRIK HULSMAN and TRIJNTJE STRUIJK. She was born 24 October 1907 in The Hague, Holland, and died 05 October 1996 in Adelaide, Australia. Occupation: Shoemaker, buffet Manager, waiter. Occupation: Domestic servant on day duty. 1. BENVENIDA HENRIQUES DE LA FUENTE, m. JOOP TOLL. 2. JACOBA HENRIQUES DE LA FUENTE. 3. HIJMAN HENRIQUES DE LA FUENTE. 4. CECILIA WILHELMINA MARIE HENRIQUES DE LA FUENTE. 5. MARIA HERIQUES DE LA FUENTE. 6. THERESIA HENRIQUES DE LA FUENTE. 7. LEONARDUS JOHANNES HENRIQUES DE LA FUENTE. 8. JACOB HENRIQUES DE LA FUENTE. 9. HENDRICK HENRIQUES DE LA FUENTE, b. 29 August 1936, Amsterdam, Holland; d. 29 August 1936, Amsterdam, Holland. 10. SJAAK HENRIQUES DE LA FUENTE, b. 29 August 1936, Amsterdam, Holland; d. 29 August 1936, Amsterdam, Holland. SOPHIE HENRIQUES DE LA FUENTE was born 19 May 1895 in Amsterdam, Holland, and died 08 October 1942 in Auschwitz concentration camp, Poland - Holocaust victim. She married NATHAN VAN DELFT 14 April 1921 in Amsterdam, Holland, son of LEVIE VAN DELFT and HENDERINE ZIEL. He was born 20 March 1892 in Amsterdam, Holland, and died 31 August 1943 in Central Europe, Municipality unknown - Holocaust victim. Occupation: Postal services post deliverer. 1. 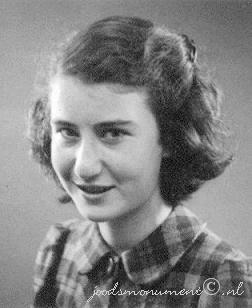 HENDRINA VAN DELFT was born 03 February 1922 in Amsterdam, Holland, and died 30 September 1942 in Auschwitz concentration camp, Poland - Holocaust victim. 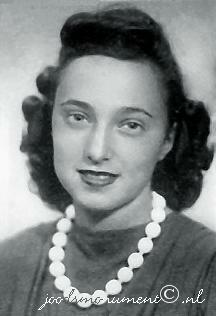 She married ABRAHAM COHEN 01 April 1942 in Amsterdam, Holland, son of JACOB COHEN and SIENTJE TOKKIE. He was born 17 April 1919 in Amsterdam, Holland, and died 30 September 1942 in Auschwitz concentration camp, Poland - Holocaust victim. Resided: Boterdiepstraat 4 II, Amsterdam, Holland. Parents of Abraham Cohen were JACOB COHEN born 01 October 1890 in Amsterdam, Holland, and died 20 September 1942 in Auschwitz concentration camp, Poland - Holocaust victim. He married SIENTJE TOKKIE 27 January 1915 in Amsterdam, Holland. She was born 26 December 1889 in Amsterdam, Holland, and died 22 July 1930 in Amsterdam, Holland. Jacob Cohen married Sientje Tokkie in 1915 in Amsterdam, Holland. She passed away in 1930. They had five children: David, Abraham, Sophia, Andries and Hijman. He remarried in 1936 in Amsterdam to Roosje de Leeuwe. According to a list with shops of Jewish owners, compiled by the Amsterdam police in 1940, this family had a shoemaker's workshop, address: Blasiusstraat 79 in Amsterdam, Holland. 2. JACOB VAN DELFT, b. 24 March 1923, Amsterdam, Holland; d. 08 October 1942, Auschwitz concentration camp, Poland - Holocaust victim. DAVID HENRIQUES DE LA FUENTE was born 27 January 1897 in Amsterdam, Holland, and died 04 May 1990 in Miami-Dade County, Florida, USA. He married ESTHER BARNSTEIN 25 November 1920 in Amsterdam, Holland, daughter of MEIJER BARNSTEIN and GRIETJE KOOKER. She was born 14 May 1896 in Amsterdam, Holland, and died 14 September 1942 in Auschwitz concentration camp, Poland - Holocaust victim. 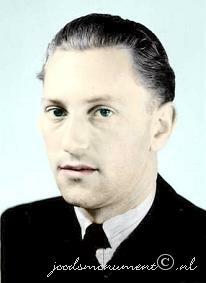 Resided with family, February 1941: Tweede Jan Steenstraat 96 I, Amsterdam, Holland. 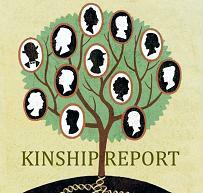 Esther Barnstein was a daughter of Meijer Barnstein and Grietje Kooker, a family with eleven children, among them herself, Betje, Hartog, Engeltje, Eva, Mina, and Maurits. Jetta, who was married to Hartog Zwalf, had survived the Holocaust as the only one of the children. Three children had already died at a very your age. Esther married 25 November 1920 in Amsterdam to David Henriques de la Fuente, son of Jacob Henriques de la Fuente and Benvenida Engers. 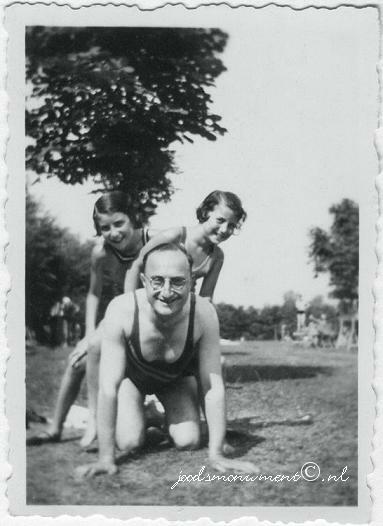 The couple had two daughters, who both have been killed during the Holocaust. David Henriques de la Fuente had survived the war. 1. BENVENIDA HENRIQUES DE LA FUENTE was born 21 August 1921 in Amsterdam, Holland, and died 16 July 1943 in Sobibor death camp, Poland - Holocaust victim. She married LION (JOHNNY) WAAS 01 April 1942 in Amsterdam, Holland, son of SALOMON WAAS and DEBORA DELDEN. He was born 31 January 1918 in Amsterdam, Holland, and died 16 July 1943 in Sobibor death camp, Poland - Holocaust victim. Parents of Lion (Johnny) Waas were SALOMON WAAS born 15 December 1893 in Amsterdam, Holland, and died 01 January 1943 in Auschwitz concentration camp, Poland - Holocaust victim. He married DEBORA DELDEN 19 September 1917 in Amsterdam, Holland, daughter of JACOB DELDEN and LEENTJE OSSEDRIJVER. She was born 22 August 1897 in Amsterdam, Holland, and died 08 October 1942 in Auschwitz concentration camp, Poland - Holocaust victim. Resided with family, February 1941: Tilanusstraat 71 I, Amsterdam, Holland. 2. MARGARETHA (TATTY) HENRIQUES DE LA FUENTE, b. 11 January 1923, Amsterdam, Holland; d. 30 September 1942, Auschwitz concentration camp, Poland - Holocaust victim. LEONARD HENRIQUES DE LA FUENTE was born 28 March 1902 in Amsterdam, Holland, and died 30 April 1944 in Central Europe, Municipality unknown - Holocaust victim. He married HENDRIKA DE VRIES 17 December 1925 in Amsterdam, Holland. She was born 19 November 1901 in Amsterdam, Holland, and died 03 September 1943 in Auschwitz concentration camp, Poland - Holocaust victim. Resided with family, February 01, 1941: Vechtstraat 87 II, Amsterdam, Holland. Leonard Henriques de la Fuente was a pianist with the Royal Concertgebouw orchestra. 1. BENVENIDA HENRIQUES DE LA FUENTE, b. 08 June 1926, Amsterdam, Holland; d. 03 September 1943, Auschwitz concentration camp, Poland - Holocaust victim. 2. MIETJE HENRIQUES DE LA FUENTE, b. 12 December 1928, Amsterdam, Holland; d. 03 September 1943, Auschwitz concentration camp, Poland - Holocaust victim. 29 December 1852 in Amsterdam, Holland. 1. BAREND SOESAN, b. 04 May 1858, Amsterdam, Holland; d. 15 August 1899, Amsterdam, Holland. 2. SIMON SOESAN, b. 29 July 1860, Amsterdam, Holland; d. 06 May 1937, Amsterdam, Holland. How are you related to Sophia Rodrigues Lopes? 1. SALOMON SOESAN, b. 05 April 1880, Amsterdam, Holland; d. 01 January 1938, Amsterdam, Holland. 2. JACOB SOESAN, b. 16 March 1882, Amsterdam, Holland; d. 26 March 1943, Sobibor death camp, Poland - Holocaust victim. 3. SIMON SOESAN, b. 21 February 1884, Amsterdam, Holland; d. 28 May 1943, Sobibor death camp, Poland - Holocaust victim. 4. MOZES SOESAN, b. 11 September 1886, Amsterdam, Holland; d. 26 October 1942, Auschwitz concentration camp, Oswiecim, Poland – Holocaust victim. 5. BETJE SOESAN, b. 16 October 1888, Amsterdam, Holland; d. 21 September 1942, Auschwitz concentration camp, Poland - Holocaust victim. 6. ROZETTE SOESAN, b. 10 December 1891, Amsterdam, Holland; d. 05 February 1943, Auschwitz concentration camp, Oswiecim, Poland – Holocaust victim. 7. JOZEF SOESAN, b. 25 June 1894, Amsterdam, Holland; d. 1960, Amsterdam, Holland. SIMON SOESAN was born 29 July 1860 in Amsterdam, Holland, and died 06 May 1937 in Amsterdam, Holland. He married EVA BETEL 09 January 1878 in Amsterdam, Holland. She was born 29 January 1855 in Amsterdam, Holland, and died 07 February 1915 in Amsterdam, Holland. 1. BAREND SOESAN, b. 18 July 1883, Amsterdam, Holland; d. 05 November 1942, Auschwitz concentration camp, Poland - Holocaust victim. 2. ROSALINA SOESAN, b. 20 February 1891, Amsterdam, Holland; d. 05 October 1942, Auschwitz concentration camp, Oswiecim Poland – Holocaust victim. SALOMON SOESAN was born 05 April 1880 in Amsterdam, Holland, and died 01 January 1938 in Amsterdam, Holland. He married RACHEL PRUIJM 07 January 1903 in Amsterdam, Holland, daughter of BAREND PRUIJM and ANNA ROOD. She was born 27 December 1876 in Amsterdam, Holland, and died 23 March 1939 in Amsterdam, Holland. 1. BAREND SOESAN was born 24 September 1903 in Amsterdam, Holland, and died 05 September 1977 in Groningen, Holland. He married NAATJE BRILLEMAN 18 September 1929 in Amsterdam, Holland, daughter of LEVIE BRILLEMAN and ELISABETH NORDHEIM. She was born 23 May 1905 in Amsterdam, Holland, and died 13 May 1995 in Zuidlaren, Drenthe, Holland. 2. SAMUEL (JACQUES) SOESAN, b. 24 September 1903, Amsterdam, Holland; d. 06 December 1944, Natzweiler-Struthof concentration camp, Vosges Mountains, Natzwiller, France – Holocaust victim; m. MARIA HUBERTINA LOUISA SUIJLEN, 12 June 1935, Amsterdam, Holland; b. 27 April 1897, Susteren, Limburg, Echt-Susteren, Holland. Resided: Geuzenstraat 17 hs, Amsterdam, Holland. Samuël Soesan (also known as Jacques) was born as one of triplets. One child died soon after birth, the other survived the war and another brother, Philip, was killed. He was married to a non-Jewish woman and they had a child. He was a member of the resistance. He was deported on 28 October 1944 from Auschwitz to Stutthof and on 17 November 1944 from there to Hailfingen, an auxiliary camp of the concentration camp Natzweiler-Struthof. One child living with its parents survived the war. Natzweiler-Struthof: was a German concentration camp located in the Vosges Mountains close to the Alsatian village of Natzwiller (German Natzweiler) in France and the town of Schirmeck about 50 km south west from the city of Strasbourg. Natzweiler-Struthof was the only concentration camp established by the Nazis to be on French territory during that period, although there were French-run temporary camps such as the one at Drancy. At the time, the Alsace-Lorraine area in which it was established was administered by Germany as an integral part of the German Reich. 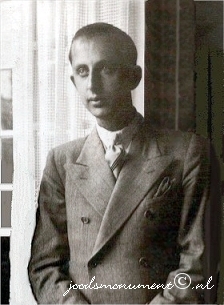 The writer Boris Pahor was interned in Natzweiler-Struthof and wrote his novel Necropolis based on this experiences there. Natzweiler-Struthof was operational between 21 May 1941 until the beginning of September 1944 when the SS evacuated the camp into Dachau. Its construction was overseen by Hans Hüttig. The camp was evacuated and sent on a "Death march" on early September 1944 with only a small SS unit keeping the camp's operations and on 23 November 1944, discovered and liberated by American Allies as the first concentration camp in Western Europe. Its system of subcamps is listed in List of subcamps of Natzweiler-Struthof. The total number of prisoners reached an estimated 52,000 over the three years originating from various countries including Poland, the Soviet Union, the Netherlands, France, Germany and Norway. The camp was specially set up for Nacht und Nebel prisoners, in most cases people of the resistance movements. The camp also held a crematorium and a gerry-rigged gas chamber outside the main camp, which was not used for mass extermination. Josef Kramer, a former commandant of the camp was executed for his crimes, including the murder of Jews in the gas chamber there. 3. SOPHIE SOESAN, b. 30 April 1905, Amsterdam, Holland; d. 07 November 1966, Zaandam, Holland. 4. PHILIP SOESAN, b. 31 August 1916, Amsterdam, Holland; d. 30 September 1942, Auschwitz concentration camp, Poland - Holocaust victim; m. FLORA VAN BUUREN; b. 18 February 1917, Amsterdam, Holland; d. 30 September 1942, Auschwitz concentration camp, Poland - Holocaust victim. Resided with family, February 1941: Rustenburgerstraat 54 II, Amsterdam, Holland. JACOB SOESAN was born 16 March 1882 in Amsterdam, Holland, and died 26 March 1943 in Sobibor death camp, Poland - Holocaust victim. He married ESTHER DRUKKER 15 March 1906 in Amsterdam, Holland, daughter of HIJMAN DRUKKER and VOGEL DE JONG. She was born 05 December 1884 in Amsterdam, Holland, and died 26 March 1943 in Sobibor death camp, Poland - Holocaust victim. Resided with wife, February 1941: Swammerdamstraat 11 I, Amsterdam, Holland. The Jokos file reveals that a claim was lodged for compensation for valuables surrendered to the Lippmann-Rosenthal looting bank (L-claim, number 11154/9168). 1. SOPHIE SOESAN, b. 24 January 1907, Amsterdam, Holland; d. 09 April 1943, Sobibor death camp, Poland - Holocaust victim. 2. HERMAN SOESAN, b. 12 November 1909, Amsterdam, Holland; d. 16 July 1943, Sobibor death camp, Poland - Holocaust victim. SIMON SOESAN was born 21 February 1884 in Amsterdam, Holland, and died 28 May 1943 in Sobibor death camp, Poland - Holocaust victim. 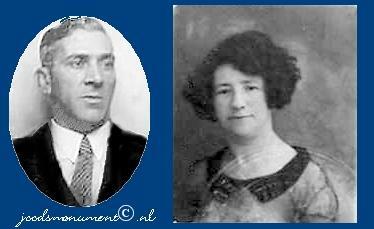 He married RACHEL CROST 09 February 1910 in Zaandam, Holland, daughter of ABRAHAM CROST and AALTJE ZUREL. 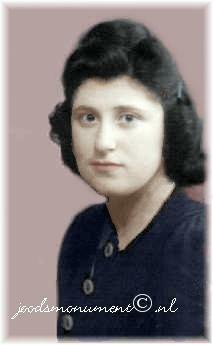 She was born 11 March 1882 in Amsterdam, Holland, and died 28 May 1943 in Sobibor death camp, Poland - Holocaust victim. Resided with wife, February 1941: Kloveniersburgwal 10 II, Amsterdam, Holland. Of Simon Soesan, only two membership cards remain, respectively for the years 1940 and 1942 of the Diamond workers Fishing Club. 1. BAREND SOESAN, b. 06 September 1910, Borgerhout, Antwerp, Belgium; d. 31 March 1944, Auschwitz concentration camp, Poland - Holocaust victim. MOZES SOESAN was born 11 September 1886 in Amsterdam, Holland, and died 26 October 1942 in Auschwitz concentration camp, Oswiecim, Poland – Holocaust victim. He married HEINTJE FRANSCHMAN 07 March 1917 in Amsterdam, Holland, daughter of LEMAN FRANSCHMAN and NAATJE DOOF. She was born 12 September 1893 in Amsterdam, Holland, and died 07 May 1943 in Sobibor death camp, Poland - Holocaust victim. 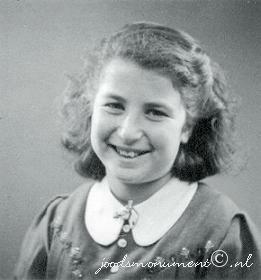 Resided with family, February 1941: Lange Houtstraat 43 III, Amsterdam, Holland. 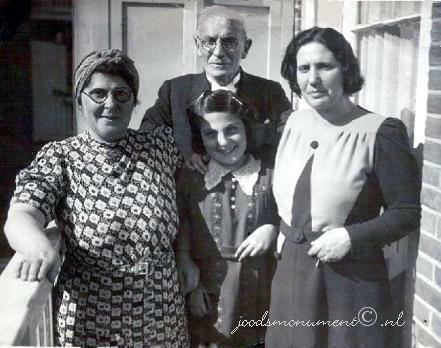 Mozes Soesan and his family, Amsterdam. Room: linoleum, carpet, lace curtain (3), drape (6), hanging lamp, table, chair (4), easy chair (2), reclining chair, sideboard, tea cupboard, divan with cover, flower table, fireplace with plate, wall mirror, standing clock, wall plate (3), ornamental flowerpot (2), wall hanging, wall cupboard. Bedroom: linoleum, mat, iron bedstead with bedding, chair (2), lace curtain, drape (2), hanging lamp. Bedroom: linoleum, mat, lace curtain, drape (2), hanging lamp, table, bedstead with bedding, chair. Bedroom: linoleum, mat (2), lace curtain, drape (2), hanging lamp, fold-out bed with casing, linen cupboard, table, table lamp, dish (2), mat. kitchen: linoleum, runner, lace curtain (2), table, enamelware, accessory, gas ring with plate, paraffin burner (2), cupboard, sink cupboard. Corridor: linoleum, mat (3), hanging lamp, coat hooks, cupboard. Attic: coal, worthless items. The Jokos files reveal that a claim was lodged for compensation for valuables surrendered to the Lippmann-Rosenthal looting bank (L-claim, number 11153 / 5650). In the summer of 1941, Jews were barred from public places in Holland, including transportation, parks, swimming pools, theatres, museums and Jewish children were barred from Dutch schools. In effect, from having any close contact with their non-Jewish countrymen. These isolating restrictions coincided with the first in a long series of heavy-handed confiscations of Jewish property. The first gang of thugs to descend on the Netherlands was the Einsatzstab Reichsleiter Rosenberg - the Rosenberg Special Operations Staff, named after the Nazi Party ideological chief Alfred Rosenberg, to whom the Fuhrer had given a free hand to steal whatever he deemed necessary to promote the Nazi cause. In the Netherlands, this began with choice Jewish libraries, both public and private. Among the prizes plundered: the famed Rosenthal Collection of precious books. To organize and centralize this massive plunder, the Nazis established a highly specialized banking institution with main offices near the Amstel river just around the corner from the elegant Amstel Hotel. To "reassure'' the Jews, they cynically named the depository "The Lippmann-Rosenthal & Co. Bank,'' the same name as that of a midsize, pre-war Dutch-Jewish bank of impeccable reputation. In point of fact, the four-story redbrick building at 13 Sarphatistraat - which soon came to be popularly known as "Liro'' - no longer had anything to do with the original bank or its Jewish founders. It had been seized from its Jewish owners in 1940 and given to a Nazi sympathizer as a prize for his loyalties to the Reich. To start the financial ball rolling, the Nazis first ordered all other Dutch banks to immediately transfer "known Jewish accounts'' to the Liro. They followed in August 1941 by issuing Verordnung (Decree) 148/41, which blocked all Jewish-owned bank accounts and instructed all Dutch Jews not only to transfer their accounts and securities from other Dutch banks to the Liro, but to deposit all cash holdings and cheques of more than 1,000 guilders as well. The massive proceeds thus assembled were then to be turned over to the Vermoogensverwaltungs-und Rentenanstalt (Office of Property Administration and Pensions). It was this central German institute that administered the Liro's loot. Jews were subsequently ordered to turn in gold and silver, jewellery, bonds, and insurance policies. Again Lippmann-Rosenthal was the central repository. By this time, the Nazis' Amsterdam bank was staffed with more than eighty Dutch employees, all drawn from respectable Dutch banks and other Netherlands financial institutions. 1. BAREND SOESAN, b. 05 January 1918, Amsterdam, Holland; d. 09 July 1943, Sobibor death camp, Poland - Holocaust victim; m. HEINTJE COELHO; b. 18 December 1921, Amsterdam, Holland; d. 09 July 1943, Sobibor death camp, Poland - Holocaust victim. Parents of HEINTJE COELHO were DAVID COELHO born 27 June 1893 in Amsterdam, Holland, and died 28 February 1943 in Auschwitz concentration camp, Oswiecim, Poland – Holocaust victim. He married HENDELTJE COHEN 21 December 1916 in Amsterdam, Holland. She was born 27 June 1893 in Amsterdam, Holland, and died 28 February 1943 in Sobibor death camp, Poland - Holocaust victim. Resided with family, February 1941: President Steynstraat 13 II, Amsterdam, Holland. The Jokos file reveals that a claim was lodged for compensation for valuables surrendered to the Lippmann-Rosenthal looting bank (L-claim, number 1788/5630). Resided: President Steynstraat 19 II, Amsterdam, Holland. 2. LOUIS SOESAN, b. 10 February 1922, Amsterdam, Holland; d. 04 June 1943, Sobibor death camp, Poland - Holocaust victim; m. VERONICA SWAAB, 02 October 1941, Amsterdam, Holland; b. 19 June 1923, Amsterdam, Holland; d. 04 June 1943, Sobibor death camp, Poland - Holocaust victim. Parents of VERONICA SWAAB were ZACHARIAS SWAAB born 31 July 1896 in Amsterdam, Holland, and died 04 June 1943 in Sobibor death camp, Poland - Holocaust victim. He married BETJE KOOPMAN 14 January 1920 in Amsterdam, Holland. She was born 10 September 1900 in Amsterdam, Holland, and died 04 June 1943 in Sobibor death camp, Poland - Holocaust victim. Resided with family, February 01, 1941: Korte Houtstraat 11 huis, Amsterdam, Holland. According to a list with shops of Jewish owners compiled by the Amsterdam police in 1940, this family had a grocery store, address: Korte Houtstraat 11 in Amsterdam, Holland. The Jokos files reveal that a claim was lodged for compensation for valuables surrendered to the Lippmann-Rosenthal looting bank (L-claim, number 11756/22366). 3. SALOMON SOESAN, b. 03 June 1925, Amsterdam, Holland; d. 28 September 1942, Auschwitz concentration camp, Oswiecim, Poland – Holocaust victim. 4. 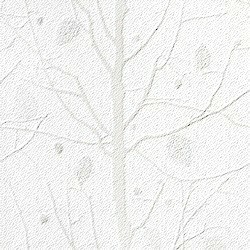 ANNA SOESAN, b. 08 October 1929, Amsterdam, Holland; d. 07 May 1943, Sobibor death camp, Poland - Holocaust victim. 5. JACOB SOESAN, b. 17 December 1932, Amsterdam, Holland; d. 07 May 1943, Sobibor death camp, Poland - Holocaust victim. BETJE SOESAN was born 16 October 1888 in Amsterdam, Holland, and died 21 September 1942 in Auschwitz concentration camp, Poland - Holocaust victim. She married BAREND SOESAN 16 November 1910 in Amsterdam, Holland, son of SIMON SOESAN and EVA BETEL. He was born 18 July 1883 in Amsterdam, Holland, and died 05 November 1942 in Auschwitz concentration camp, Poland - Holocaust victim. Resided: Sparrenweg 7 I, Amsterdam, Holland. First cousin marriage to Barend Soesan. Divorced: 27 February 1920, Barend Soesan. 1. SOPHIA SOESAN, b. 10 August 1911, Amsterdam, Holland; m. HEINRICH WILHELM LENNARTZ, 20 September 1933, Amsterdam, Holland; b. 20 October 1909, Bad Aachen, North Rhine-Westphalia, Germany. ROZETTE SOESAN was born 10 December 1891 in Amsterdam, Holland, and died 05 February 1943 in Auschwitz concentration camp, Oswiecim, Poland – Holocaust victim. She married SIMON BLES 24 February 1915 in Amsterdam, Holland, son of WOLF BLES and MIETJE FIERLIER. He was born 14 April 1884 in Amsterdam, Holland, and died 05 February 1943 in Auschwitz concentration camp, Oswiecim, Poland – Holocaust victim. Resided with family, February 1941: Graaf Florisstraat 3 huis, Amsterdam, Holland. 1. BAREND BLES, b. 17 July 1915, Amsterdam, Holland; d. 30 September 1942, Auschwitz concentration camp, Oswiecim, Poland – Holocaust victim. 2. WOLF BLES, b. 01 June 1917, Amsterdam, Holland; d. 30 September 1942, Auschwitz concentration camp, Oswiecim, Poland – Holocaust victim. 3. SOLOMON BLES, b. 18 December 1918, Amsterdam, Holland; d. 15 March 1943, Central Europe, Municipality unknown - Holocaust victim. 4. EMANUEL BLES, b. 21 November 1922, Amsterdam, Holland; d. 15 March 1945, Mauthausen sub camp, Extern kommando Gusen extermination Camp, Austria – Holocaust victim. Mauthausen Concentration Camp grew to become a large group of German concentration camps that was built around the villages of Mauthausen and Gusen in Upper Austria, roughly 20 kilometres (12 mi) east of the city of Linz. Its history ran from the time of the Anschluss in 1938 to the last week of the Second World War. JOZEF SOESAN was born 25 June 1894 in Amsterdam, Holland, and died 1960 in Amsterdam, Holland. He married MATHILDA MEIJER 15 April 1920 in Amsterdam, Holland, daughter of SALOMON MEIJER and NAATJE KONIJN. She was born 26 May 1892 in Amsterdam, Holland, and died 29 December 1971 in Amsterdam, Holland. BAREND SOESAN was born 18 July 1883 in Amsterdam, Holland, and died 05 November 1942 in Auschwitz concentration camp, Poland - Holocaust victim. He married (1) ESTHER SEALTIEL 13 April 1905 in Amsterdam, Holland. She was born 09 September 1881 in Amsterdam, Holland, and died 04 November 1957 in Amsterdam, Holland. He married (2) BETJE SOESAN 16 November 1910 in Amsterdam, Holland, daughter of BAREND SOESAN and SOPHIA LOPES. She was born 16 October 1888 in Amsterdam, Holland, and died 21 September 1942 in Auschwitz concentration camp, Poland - Holocaust victim. He married (3) ESTHER LAZARUS 20 July 1921 in Amsterdam, Holland, daughter of LAZARUS LAZARUS and SARA RIMINI. She was born 25 October 1886 in Amsterdam, Holland, and died 09 July 1943 in Sobibor death camp, Poland - Holocaust victim. Resided with husband, Februaary 1941: Keizersgracht 8 huis, Amsterdam, Holland. Buriel: 06 November 1957, Beth Haim cemetery, Ouderkerk aan de Amstel, Holland. The Jokos file reveals that a claim was lodged for compensation for valuables surrendered to the Lippmann-Rosenthal looting bank (L-claim, number 11151/6838). 1. SOPHIA SOESAN, b. 10 August 1911, Amsterdam, Holland; m. HEINRICH WILHELM LENNARTZ, 20 September 1933, Amsterdam, Holland; b. 20 October 1909, Bad Aachen, North Rhine-Westphalia, Germany. Child is listed under Betje Soesan. 1. FRANÇOIS SOESAN, b. 25 March 1922, Paris, France; d. 31 March 1944, Central Europe, Municipality unknown - Holocaust victim; m. HELENA PAUR; b. 16 September 1922, Amsterdam, Holland; d. 13 November 1942, Auschwitz concentration camp, Poland - Holocaust victim. Parents of HELENA PAUR were MARCUS PAUR born 05 February 1891 in Amsterdam, Holland, and died 30 September 1942 in Auschwitz concentration camp, Poland - Holocaust victim. He married FIJTJE WEENEN 01 September 1915 in Amsterdam, Holland. She was born 30 January 1893 in Amsterdam, Holland, and died 13 November 1942 in Auschwitz concentration camp, Poland - Holocaust victim. Resided with wife, September 09, 1942: Pretoriusstraat 68 II, Amsterdam, Holland. ROSALINA SOESAN was born 20 February 1891 in Amsterdam, Holland, and died 05 October 1942 in Auschwitz concentration camp, Oswiecim Poland – Holocaust victim. She married MARCUS DE VRIES 23 May 1918 in Zaandam, Holland, son of MACHIEL DE VRIES and LEENTJE DE HAAN. He was born 07 October 1895 in Amsterdam, Holland, and died 31 October 1943 in Schoppinitz, Katowice, Poland - Holocaust victim. In April 1937 Marcus de Vries was registered on Transvaalplein 22 huis, coming from Veeteeltstraat 29 I. Parents of Marcus de Vries were MACHIEL DE VRIES born 27 March 1857 in Leeuwarden, Holland. He married LEENTJE DE HAAN 25 July 1883 in Amsterdam, Holland, daughter of MARCUS DE HAAN and SAARTJE PAIS. She was born 01 May 1859 in Leeuwarden, Holland, and died 19 February 1943 in Auschwitz concentration camp, Oswiecim Poland – Holocaust victim. Resided: Guest house 'Verdooner', Weesperzijde 141 huis, Amsterdam, Holland. Guest house 'Verdooner' was run by Salomon Verdooner, who lived at the same address. SOPHIE SOESAN was born 30 April 1905 in Amsterdam, Holland, and died 07 November 1966 in Zaandam, Holland. She married JUDA BRILLEMAN 28 December 1926 in Amsterdam, Holland, son of LEVIE BRILLEMAN and ELISABETH NORDHEIM. He was born 23 April 1903 in Amsterdam, Holland, and died 18 May 1995 in Zaandam, Holland. 1. LIESBETH BRILLEMAN, b. 26 February 1928, Amsterdam, Holland. SOPHIE SOESAN was born 24 January 1907 in Amsterdam, Holland, and died 09 April 1943 in Sobibor death camp, Poland - Holocaust victim. 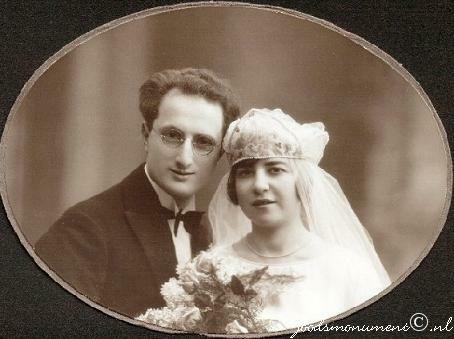 She married SALOMON LOBATTO 11 September 1929 in Amsterdam, Holland, son of RUDOLPH LOBATTO and ROZA LIONI. He was born 25 August 1904 in Amsterdam, Holland, and died 09 April 1943 in Sobibor death camp, Poland - Holocaust victim. Parents of SALOMON LOBATTO were RUDOLPH LOBATTO born 30 January 1874 in Amsterdam, Holland, and died 17 September 1942 in Auschwitz concentration camp, Poland - Holocaust victim. He married ROZA JUDITH LIONI 17 September 1903 in Amsterdam, Holland. She was born 30 April 1877 in Amsterdam, Holland, and died 17 September 1942 in Auschwitz concentration camp, Poland - Holocaust victim. Resided with wife, February 1941: Ruyschstraat 9 boven, Amsterdam, Holland. Rudolph Lobatto and his family, Amsterdam. Room: small round table, bedside table, tea table, paraffin burner (2), oil stove, glass set and dinner set, clothing, underwear. The Jokos file reveals that a claim was lodged for compensation for valuables surrendered to the Lippmann-Rosenthal looting bank (L-claim, number 7712/6070 vervallen). Resided with family, February 1941: Swammerdamstraat 4 II, Amsterdam, Holland. 1. RUDOLPH JACOB LOBATTO, b. 25 November 1930, Amsterdam, Holland; d. 09 April 1943, Sobibor death camp, Poland - Holocaust victim. 2. ESTHER ROZA L. LOBATTO, b. 15 September 1932, Amsterdam, Holland; d. 09 April 1943, Sobibor death camp, Poland - Holocaust victim. 3. JACOB HERMAN B. LOBATTO, b. 12 December 1936, Amsterdam, Holland; d. 09 April 1943, Sobibor death camp, Poland - Holocaust victim. HERMAN SOESAN was born 12 November 1909 in Amsterdam, Holland, and died 16 July 1943 in Sobibor death camp, Poland - Holocaust victim. He married RACHEL ELSAS 03 February 1938 in Amsterdam, Holland, daughter of SALOMON ELSAS and FENNA SOESAN. 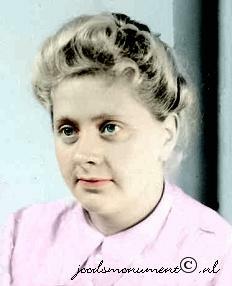 She was born 02 February 1915 in Amsterdam, Holland, and died 16 July 1943 in Sobibor death camp, Poland - Holocaust victim. Resided with family, February 1941: Ruyschstraat 32 III, Amsterdam, Holland. Parents of Rachel Elsas were SALOMON ELSAS born 27 December 1887 in Amsterdam, Holland, and died 06 March 1944 in Auschwitz concentration camp, Poland - Holocaust victim. He married FENNA SOESAN 29 September 1910 in Amsterdam, Holland, daughter of RUBEN SOESAN and RACHEL KAT. She was born 24 June 1888 in Amsterdam, Holland, and died 06 March 1944 in Auschwitz concentration camp, Poland - Holocaust victim. Resided with wife, February 1941: Plantage Kerklaan 22 III, Amsterdam, Holland. 1. JACOB SALOMON SOESAN, b. 15 November 1939, Amsterdam, Holland; d. 16 July 1943, Sobibor death camp, Poland - Holocaust victim. BAREND SOESAN was born 06 September 1910 in Borgerhout, Antwerp, Belgium, and died 31 March 1944 in Auschwitz concentration camp, Poland - Holocaust victim. He married SARA NEBIG 06 May 1936 in Amsterdam, Holland, daughter of LEVIE NEBIG and RIKA SLIER. She was born 27 September 1914 in Amsterdam, Holland, and died 11 June 1943 in Sobibor death camp, Poland - Holocaust victim. Parents of SARA NEBIG were LEVIE NEBIG born 31 May 1892 in Amsterdam, Holland, and died 31 August 1943 in Central Europe, Municipality unknown - Holocaust victim. He married RIKA SLIER 02 June 1915 in Amsterdam, Holland. She was born 15 October 1887 in Amsterdam, Holland, and died 08 October 1942 in Auschwitz concentration camp, Poland - Holocaust victim. Resided with family, February 1941: President Steynplantsoen 12 II, Amsterdam, Holland. 1. RACHEL SOESAN, b. 20 December 1938, Amsterdam, Holland; d. 11 June 1943, Sobibor death camp, Poland - Holocaust victim. 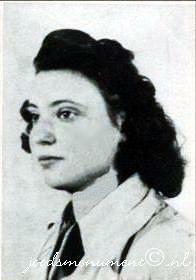 Rachel Soesan was deported to Sobibor in June 1943 from Vught via Westerbork on the so-called children's transport. 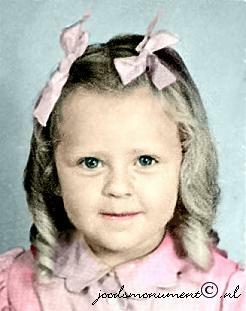 She was 4 years old when she was murdered.